“Establishing the district costs the city no money but provides an additional economic development tool to further the revitalization of downtown,” Mayor John Ditslear said. The Riverfront Redevelopment District designation is a way to increase retail and tourism activities, which will strengthen the economic vitality of the riverfront area – the historic downtown square to the east and Federal Hill Commons to the west. The area extends 1,500 feet from each side of the buildable bank of the White River. “The creation of the Riverfront Redevelopment District will help further the City of Noblesville by removing barriers for development. 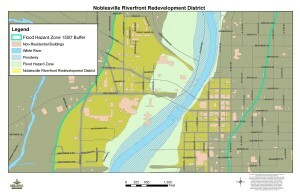 Through the creation of this district, the city will be able to attract additional development opportunities, expand the tax base and create more opportunities for the people of Noblesville, Hamilton County and surrounding areas to enjoy the various venues present in this proposed redevelopment district,” said Alaina Shonkwiler, Noblesville economic development specialist. Traditionally, Indiana communities are limited on the number of alcoholic beverage licenses and state legislated quotas are determined by the population of the most recent U.S. Census. Those licenses also are bought and sold on the open market, which can drastically increase their cost. Application for a license in the district is the same set forth elsewhere in the community. The district designation provides the opportunity to allow an unlimited number of three-way and two-way licenses sold at the state designated purchase rate as opposed to the private market rate. This provides Noblesville new opportunities to increase the number of restaurants and nightlife that can be located in the district. “This Riverfront Redevelopment District designation will put Downtown Noblesville well on its way to becoming a true dining destination and improve the visitor experience in an already vibrant downtown,” said Dave Pumphrey, owner of Copper Still Kitchen and Bar. Three-way liquor licenses allow the sale of beer, wine and liquor at restaurants while two-way licenses allow for just beer and wine. Currently, the city has all 32 of its three-way licenses in use and eight of its 24 two-way licenses available. The proposed redevelopment district is another way the city is working to advance and expand downtown. Since Jan. 1, 2013, $2,682,980.17 has been spent to improve the downtown area, including $1,463,316 by the City of Noblesville for public infrastructure and $242,816.62 in its façade grant program. The City of Noblesville anticipates spending $9.7 million in the next two years in the redevelopment district for the Federal Hill Commons and BlueSky projects.